Heat oven to 375°F. Spray quiche dish, 9x1 1/2 inches, with cooking spray. Mix 1 1/2 cups of the cheese, the whipping cream, pesto, spinach and eggs until well blended; pour into quiche dish. Bake 25 to 30 minutes or until knife inserted in center comes out clean. Sprinkle with remaining 1/2 cup cheese. Bake 2 to 3 minutes longer or until cheese is melted. While quiche is baking, heat spaghetti sauce in small saucepan until hot; keep warm. To serve, cut quiche into wedges. Serve with spaghetti sauce. Oh, the sourdough! 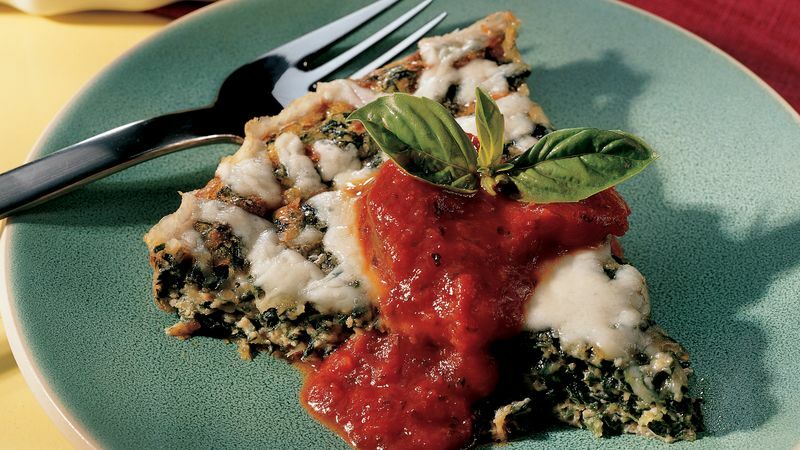 Its delightful crust and tangy flavor are just the right match for this quickie quiche. No whipping cream on hand? Just swap half-and-half or whole milk.